A friend of mine in Sydney, Australia, asked for help in explaining these stones. I don't know if this is really a puzzle, but he's definitely puzzled. 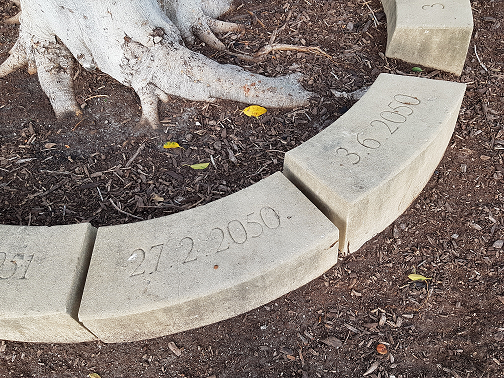 "The dates were chosen using a random selection of birthdays from the children of nearby Annandale Public School, forging a powerful connection between the artwork and the local community." They're 50 year anniversary markers of some event. Not the answer you're looking for? Browse other questions tagged real sequence or ask your own question. The king and his daughter!